After reading Stars Over Sunset Boulevard, I was really impressed with Susan Meissner’s writing. I started out not really in the mood to read her book and then I was sucked into the story and enjoyed the characters and plot so much that I was pretty bummed when it was over. So obviously I had experience with Meissner’s writing before this book, so when it came across my desk for review it was an easy yes however her name wasn’t what caught my eye about this book. The name only cemented my acceptance to review it….what got me was the cover. I am absolutely in love with the beauty of this cover. It hints at glamour and romance and the colors worked so well that I couldn’t pass it up. Present day. Facing a crossroads in her own life, Brette Caslake visits the famously haunted Queen Mary at the request of an old friend. 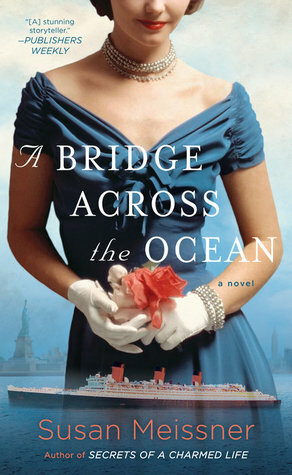 What she finds will set her on a course to solve a seventy-year-old tragedy that will draw her into the heartaches and triumphs of the courageous war brides and will ultimately lead her to reconsider what she has to sacrifice to achieve her own deepest longings (summary from Goodreads). I’m typically not really that into post war novels but as I said before, this one looked so good that I had a hard time passing it up. If Stars Over Sunset Boulevard was good, this one was better. This book was so much more than just a historical fiction novel, it was a combination of mystery, women’s fiction, and a hint of super-naturalism as well. I didn’t expect to enjoy the ghost story plot points that much but I thought this approach worked well in the novel. It isn’t necessarily a book about ghosts, but rather the ghosts are what connect the three main characters. It isn’t even really a major theme in the story but it was one that I thought was unique and for some reason worked really well and didn’t distract from the overall narrative or other plot points. So if you aren’t a reader that enjoys ‘ghost stories’ or supernatural elements, you have nothing to fear with this one, it’s more mystery/women’s fiction than ghost story. I personally liked Brette’s perspective the best which I found surprising. Typically I gravitate toward the historical characters but I found Brette interesting and engaging and for some reason I just felt really connected to her. Her whole gift for seeing ghosts caught my attention and held it throughout the novel. As for the other women and perspectives, I felt attached and invested in their stories but maybe it was Brette’s ‘gift’ that just hooked me. This story is complex and has many layers for readers to uncover and enjoy. Meissner has a beautiful writing style and ability to write detailed, well researched historical fiction stories. I truly felt like I was on the Queen Mary based on her descriptions. Her story and historical details were second to non. I loved this book! Well written, interesting, and intriguing!